The first launch umbilical for NASA’s Space Launch System (SLS) and Orion spacecraft was installed on the mobile launcher tower March 16 at the agency’s Kennedy Space Center in Florida. The Orion Service Module Umbilical, or OSMU, was installed high up on the tower at about the 260-foot level. 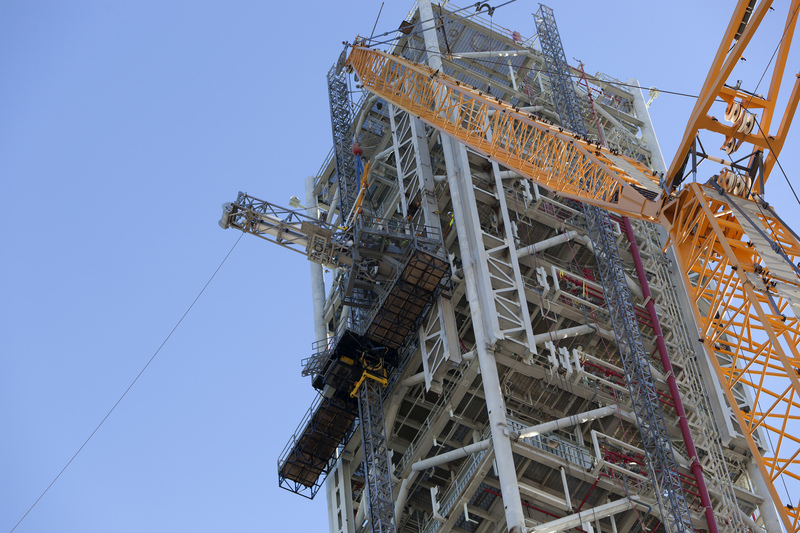 The tower on the mobile launcher will be equipped with several connections, called launch umbilicals, which will connect to the SLS core stage and twin solid rocket boosters, the interim cryogenic propulsion stage and the Orion spacecraft. They will provide power, communications, coolant and fuel. The OSMU will connect from the mobile launcher tower to the Orion service module. Prior to launch, the umbilical will transfer liquid coolant for the electronics and purge air/ GN2 for environmental control to the Orion service module that houses these critical systems to support the spacecraft. The umbilical also will provide purge air/GN2 for environmental control to the Launch Abort System. Before launch, the OSMU will tilt up and the umbilical lines will disconnect. The first integrated launch of SLS and Orion, Exploration Mission 1, will send the spacecraft to a stable orbit beyond the moon. Orion will return to Earth and be recovered from the Pacific Ocean. The mission will demonstrate the integrated performance of the SLS rocket, Orion and ground support teams.